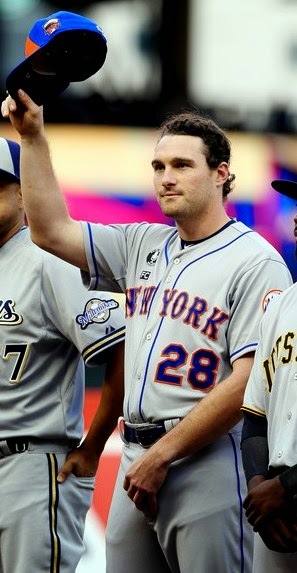 Daniel Thomas Murphy was born April 1, 1985 in Jacksonville, Florida. 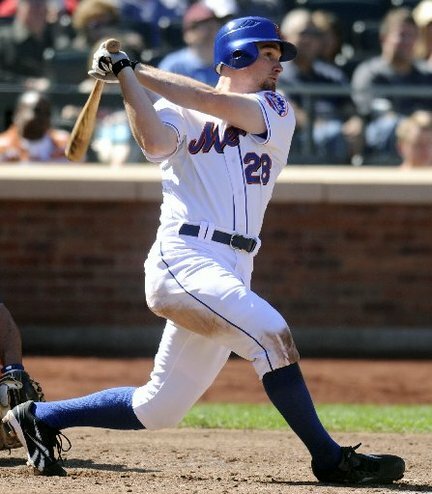 The six foot two left hand hitting, right hand throwing Murphy attended Jacksonville University getting drafted by the New York Mets in the 13th round of the 2006 amateur draft. That season he played in the Rookie League at Kingsport & the Gulf Coast before getting to the A ball Brooklyn Cyclones for eight games at the end of the year. There he was 7-29 (.241) with one double & three RBIs. In 2007 he played at A Ball St. Lucie developing into a good hitter batting .285 with 11 HRs 78 RBIs in 135 games as the teams main third baseman. In 2008 he started the year back with the Brooklyn Cyclones for three games before moving up to AA Binghamton where he hit .308. He was promoted to AAA New Orleans for just one game, then when Marlon Anderson went down with injury he was called up to the Mets. Murphy was a third baseman but when he arrived with the Mets David Wright was the teams third baseman so he was placed in the outfield. He debuted on August 2nd getting a base hit off the Astros Roy Oswalt in his first career at bat in a game at Houston. In the outfield he made a catch against the left field wall & then threw a runner out at second base. The next day he would draw a walk as a pinch hitter & not get an official at bat. 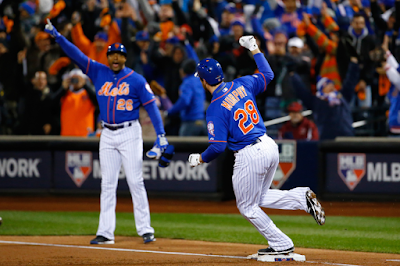 The Mets came home & Murphy began a six game hit streak. He also became the 5th Mets rookie to have ten hits in first twenty at bats. He would hit two HRs in his second week of play & bat over .400 in his first 18 games in the major leagues. He cooled off in September but still hit well, he had 131 official at bats which qualified him as a rookie in MLB rules. In his rookie year he batted .313 with nine doubles 2 HRs 18 walks 17 RBIs & a .397 on base %. 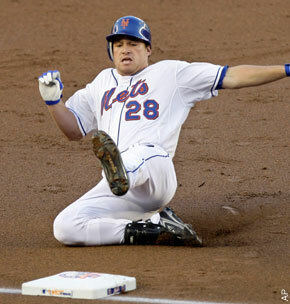 In 2009 the Mets began play at the new Citi Field, injuries to many key players brought change & disappointment to the fans. With Carlos Delgado going down to injury in May, Murphy got a chance to be the teams everyday first baseman. He was the teams Opening Day left fielder in Cincinnati & hit a HR off Aaron Harang while also driving in the other Mets run to led Johan Santana to a 2-1 victory. In April he hit safely in 17 of 20 games. In May he began with back to back games where he hit HRs both coming in Philadelphia against the Phillies. He made the transition over to first base but then began to struggle at the plate as his average fell to .248 by the All Star break. On August 16th he won the game with a bottom of the 9th base hit off San Francisco's Jeremy Affeldt for a walk off win. On August 27th he drove in three runs with two doubles in a 10-3 Mets win in Florida against the Marlins. On September 6th he hit a solo HR & drove in all four Mets runs in a 4-2 win over the Chicago Cubs at Citi Field. He had a good September hitting five HRs while driving in 17 runs. 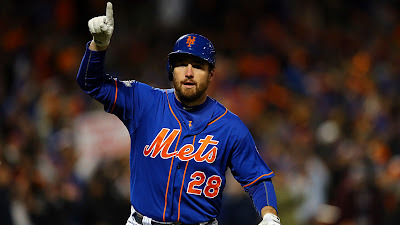 He finished the year leading the weak hitting Mets ball club with 12 HRs, a tie for the lowest season total in team history. He was second on the club to David Wright in doubles (38) & RBIs (63). 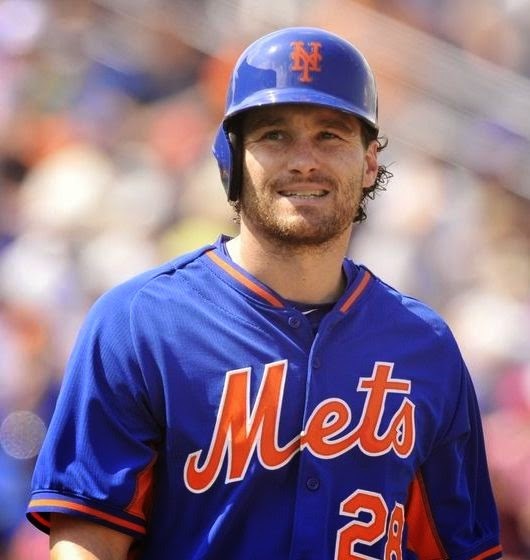 Murph posted a .266 average with a .313 on base % playing in 155 games. At first base he made ten errors & posted a .989 fielding %. 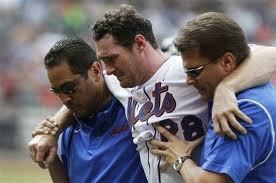 In Spring Training 2010, Murph injured himself in a run down play on March 30th. In June while preparing to get back to the Mets he suffered a high grade MCL tear at AAA Buffalo after playing just eight games there. Surgery was not needed but his season was over. 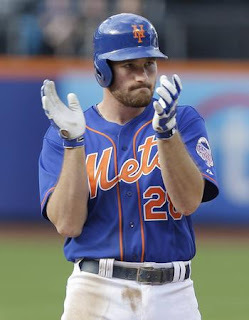 In 2011 he was back in action but now Ike Davis was the team's first baseman & Murph moved over to play second for the departed Luis Castillo. 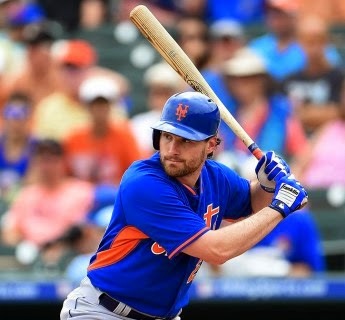 Throughout the season the versatile Murph, would play third base when David Wright went down with injury & first base again when Ike Davis was out with injury. Trivia: It was Murph who was the plate on May 1st at Citizen's Bank Park in Philadelphia when the fans began to chant "USA - USA" upon hearing the happy news that Osama bin laden had been killed by US forces. Murph put together a hitting streak hitting safely in 15 of 16 games in May followed by two eight game streaks in June. At the end of June he drove in ten runs in the last five games , with a four RBI day in Detroit during a Mets 16-9 win over the Tigers. He got his average back up over .300 through the summer and in the final two weeks of July also drove in a dozen runs. Then in early August he himself went down with injury as a torn MCL ruined his promising season. He finished 2011 with a .320 batting average 6 HRs 28 doubles 49 RBIs a .362 on base % in 109 games played. Murphy began the 2012 season with two hits on Opening Day & had a good April where hit safely in 17 of 23 games. 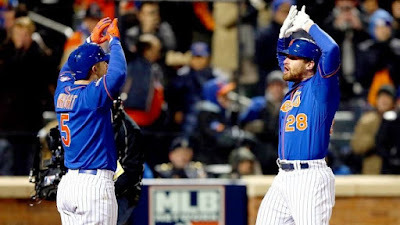 On April 9th, Murphy hit a game winning walk off single off the Washington Nationals Henry Rodriguez for a 4-3 Mets win. From May 6th through May 13th he drove in seven runs while in the middle of a twelve game hit streak. He enjoyed a seven game hit streak going into June, contributing to an 8-0 Johan Santana win with three RBIs against the St. Louis Cardinals. 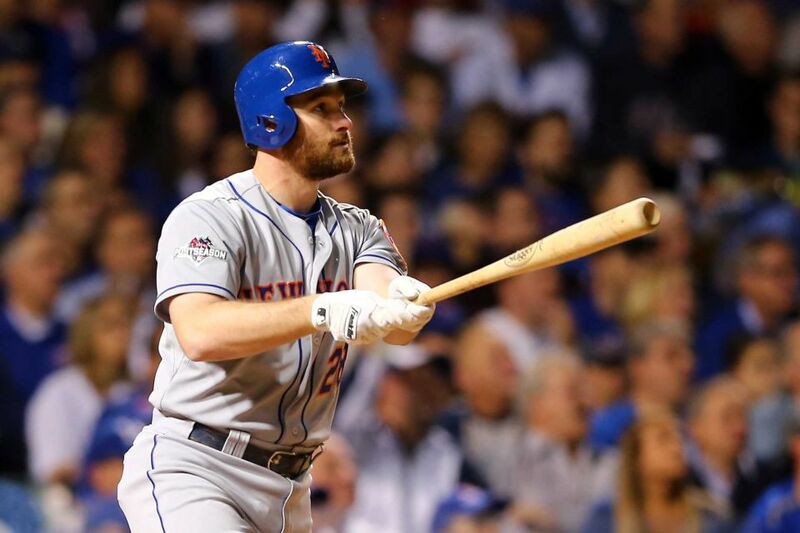 On June 27th, after 352 at bats without a HR, Murph hit a pair while driving in four runs in a 17-1 Mets blow out at Wrigley Field. 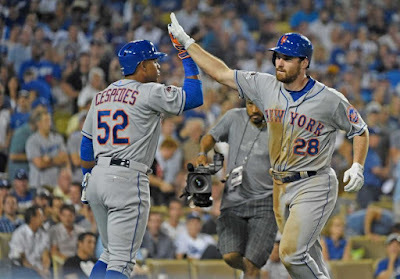 Two days later, Murph drove in five runs including a two run HR off Shawn Tolleson in a 9-0 R.A. Dickey shut out against Los Angeles at Dodger Stadium. On July 3rd he had yet another multi RBI game, driving in four more runs in an 11-1 win over the Philadelphia Phillies at Citi Field. He got over the .300 mark entering August & ended the month with a nine game hit streak into September. Murphy finished the year playing the most games of his career (156). 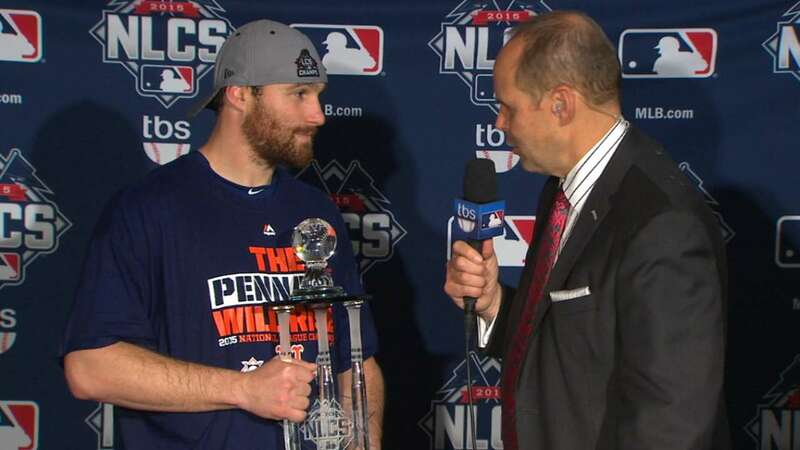 He was second on the club to David Wright in batting (.291) & doubles (40) which were seventh most in the NL. Murphy scored 65 runs, posted a .332 on base % & led the team with three triples. At second base (138 games) he made 15 errors (2nd in the NL) & posted a .974 fielding %. Murph also played 12 games at first base. Personal: In the off season, Murph married his long time girlfriend; Tori Ahem in a Florida ceremony. In 2013 he would establish himself as one of the leagues best offensive second baseman. Murph started out the year with a good April, on April 5th he hit his first a HR, a three run shot at Citi Field in a loss to the Miami Marlins. On April 12th, on a cold day in Minnesota, Murph had a four hit, four RBI day in a 16-5 win over the Twins. After batting over .400 in the first half of the month he cooled out to end April at .290. In May he hit safely in 11 of 12 games to get back over the .300 mark. 0n May 27th, in the subway series Mets sweep, Murph got the game winning hit off David Robertson, with an 8th inning single scoring Jordany Valdespin giving the Mets a 2-1 lead. In mid July he drove in runs in seven of ten games, diving in a total of twenty in the month. 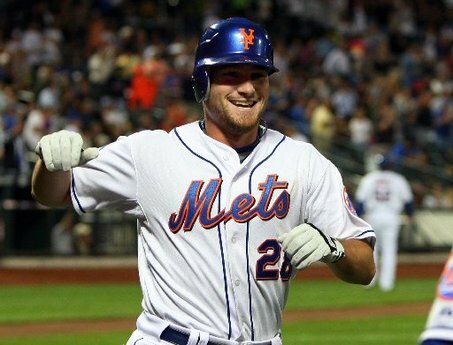 In the first game of a July 26th doubleheader in Washington, Murph had a huge four hit, two HR, five RBI day, in the 11-0 Mets win. On that same road trip he would have a three RBI day in Miami in a 6-5 Mets win. In August he hit safely in 22 of 27 games, continuing as one of the Mets steadiest hitters. In September Murph hit eight doubles, with 15 more RBIs & he ended the year with an eleven game hit streak. Murph put in another solid season in 2013, as he led the club in hits (188) which was second in the NL. He also led the team in doubles (38) which was 7th in the NL, as well as RBIs (78) runs scored (92) at bats (658) & games (161). He also hit 13 HRs with 23 stolen bases (7th in the NL) & posted a .319 on base %. It was his low on base %, that had the Mets front office trying to trade him off at the Winter Meetings. The team asked a lot in return & found no takers. Murph says he believes in hitting coach (as well as Sandy Alderson's) Dave Hudgens philosophy of deeper pitch counts & higher on base %. Murph feels his eyes tell him he can drive more pitches than not, hence not getting deeper into counts. At second base he was second among all NL second baseman in games played (150) put outs (263) errors (15) & third in double plays turned (86). In the off season there was some rumblings of the Mets trading Murphy, but no deals were made. Murph answered by making his first All Star team. Although he missed over two weeks of action in August / September he still finished with 172 hits (9th in the NL) 124 singles (5th in the NL) 56 at bats (9th in the NL) & he averaged a strike out very 6.9 at bats (8th best in the NL). 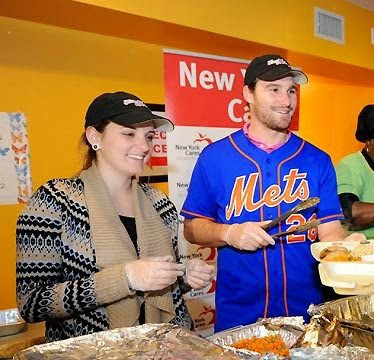 Charity: After Hurricane Sandy hit the New York area, Murphy helped out the NY Cares charity distributing food & supplies to residents of Far Rockaway Queens. Family: His wife gave birth to their first son; Noah on March 31st. 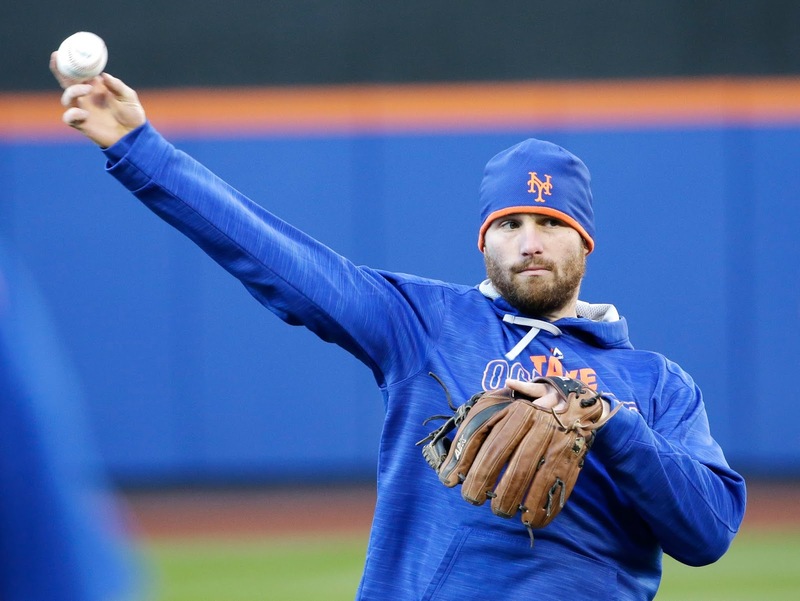 Murphy was granted a three day leave by the MLB collective bargaining agreement. 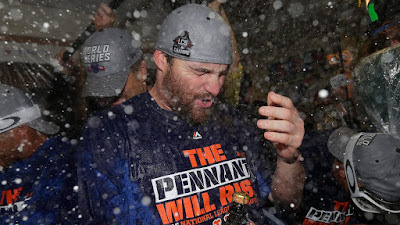 The move was heavily criticized by many people (including centerfieldmaz) since Murph missed Opening Day for his team. Certain New York radio personalities also made negative comments, Mets Manager Terry Collins commented back saying those guys should look in the mirror. Since Murph has become an advocate of working fathers & has spoken at the White House for the Working Fmilies Summit in 2014. He began the 2014 season with a hit & a walk on opening day, continuing on from there hitting safly in 23 of 26 games in April. On April 10th he had a three hit three RBI day, leading the Mets to a 6-4 win over the Braves in Atlanta. In the May subway series he started out with two hits the first night in the Bronx, then helped the Mets in the two game sweep with a HR & four RBIs the next night in a 12-7 win. This came in the middle of his second ten game hit streak of the young season. In June he remained consistent keeping his average at .300, while hitting three HRs in the month driving in 11 runs. At the All Star break he was batting .295 with 105 hits (2nd most in the NL) & was picked to represent the Mets at the All Star game in Minnesota. Murph struck out against Fernando Rodney to end the 8th inning. After the All Star Game he went on to have 13 games where he had at least two hits or more, driving in 15 runs in that time as well. He drove in runs in five straight games, six of seven on a mid August road trip to Philadelphia & Washington. Murphy was leading the NL in hits at one point & was on pace for a 200 hit season before landing on the DL on August 24th. He returned on September 9th & got himself a welcome back hit. 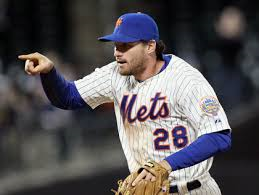 On September 19th he had a four hit day at Turner Field in a 5-0 Zach Wheeler Mets shut out. Murphy finished the year leading the club in batting (.289) hits (172) doubles (37) runs scored (79) & at bats (596). In 126 games at second base he posted a .962 fielding % while committing the most errors at the position with 15. Once again in the off season his name came up in trade talks, but no deal was made. In Spring Training 2015 Murph had a minor ham string injury but was able to be ready for Opening Day. 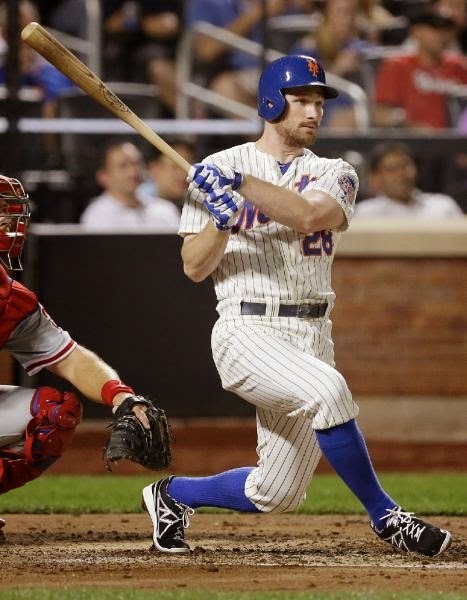 Murphy has drawn comparisons to Keith Hernandez in his style of hitting. In his eight year career, he has 967 hits with 62 HRs 228 doubles 20 triples 402 RBIs batting .288 with a .331 on base %. He has struck out 440 times with 218 walks in 3354 at bats in 903 games. During Spring Training Billy Bean was going around to baseball teams to promote Inclusion to MLB. Murphy a Religious man stated "I do disagree with the fact that Billy is a homosexual. That doesn’t mean I can’t still invest in him and get to know him. You can still accept him but I do disagree with the lifestyle, 100%." After these comments became controversial to some, Murph said he'll stick with baseball & not tell reporters about his Religious beliefs anymore. 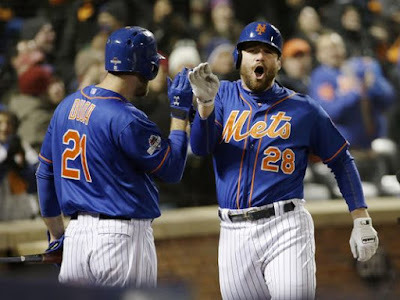 He had a slow start in April ending the month batting under .200 (.198) but did have a big four RBI day against the Atlanta Braves on April 23rd in a 6-3 Mets win. At the end of the month he has two RBIs in a subway series loss across town & then the next day, drove in all three runs in 3-1 win over the Marlins in Miami. In May the hits started to come easier as he raised his batting average to .272 while driving in 12 runs. In June he went on the DL for three weeks missing action from June 5th through the 30th. In his return he had four hits in a series in which the Mets got swept by the team they would end up sweeping in that year's NLCS, the Chicago Cubs. Considering the amazing post season run Murph would have, it's funny to see that the most HRs he hit any month during the regular season was four, as he did it in both August& amp; September. 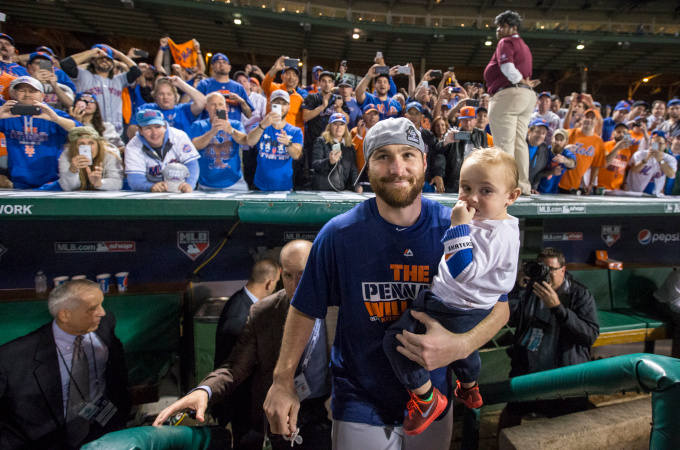 2015 POST SEASON: On October 9th, 2015 Murph got to play in his first post season game, finally enjoying the benefits after playing seven struggling seasons with the Mets. 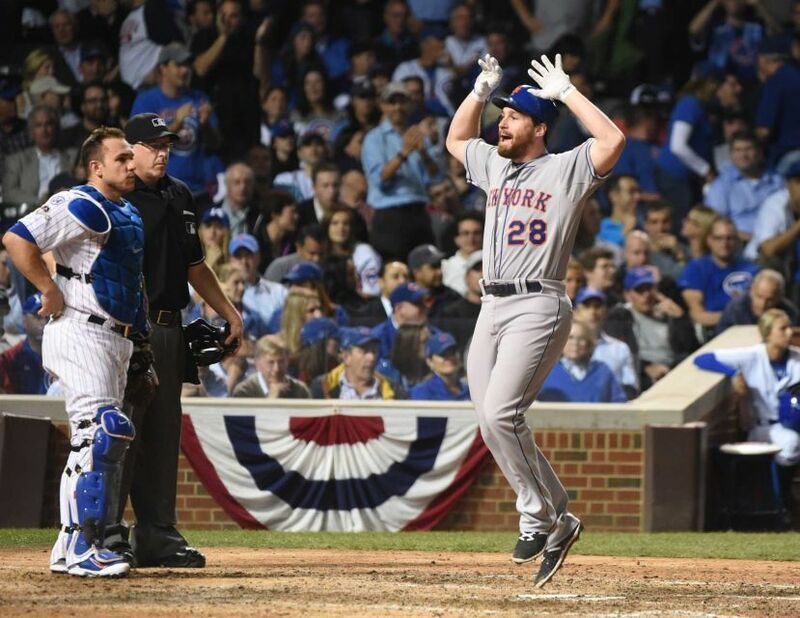 2015 NLDS: In the bottom of the 4th inning of Game #1 against the LA Dodgers, he put the Mets on the board with their first post season run as he hit a solo HR off one of the games best pitchers; Clayton Kershaw. In the Game #2 loss he collected a base hit off Zack Greinke. 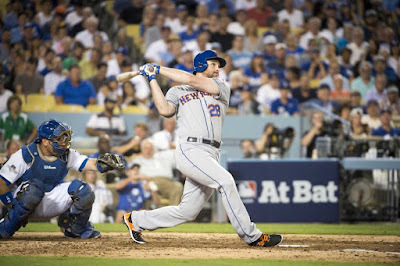 In the Game #3 Mets 13-7 rout at Citi Field, Murph added a 4th inning RBI base hit off Dodgers reliever; Alex Wood. 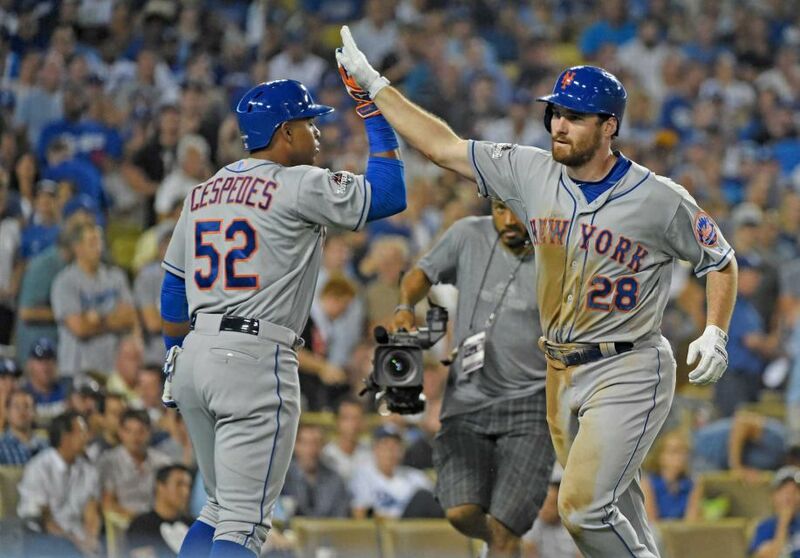 As the NLDS moved back to LA for the decisive Game #5 Murph's star was really about to shine. In the top of the 1st, Curtis Granderson led off the game with a base hit. After David Wright struck out, Murph doubled to left field off Zack Greinke, another of the games best pitchers, making it 1-0 Mets. 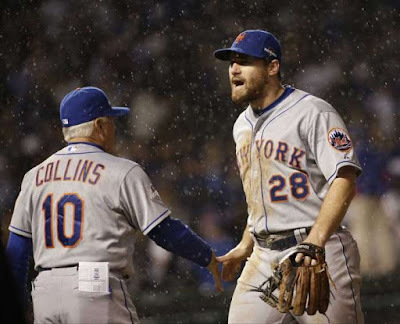 2015 NLCS: On October 17th, 2015 the Mets hosted the Chicago Cubs in the NLCS Game #1. 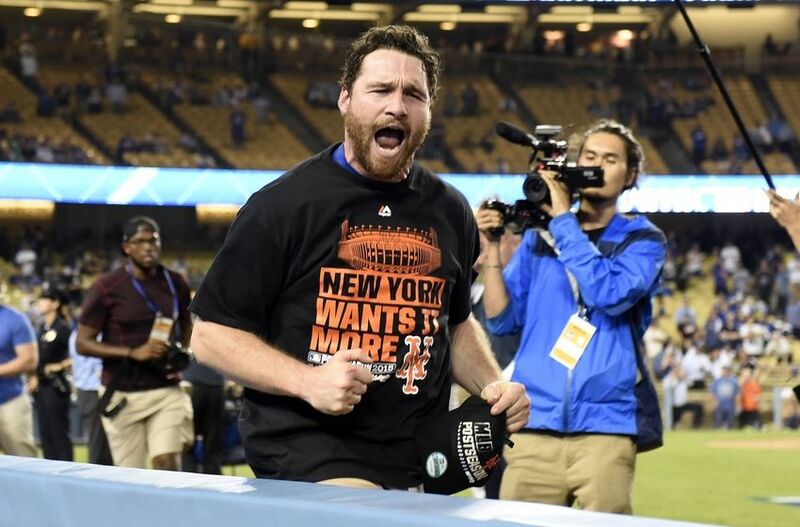 The man everyone was talking about; Daniel Murphy electrified Citi Field as he blasted a line drive HR to right field, off Cub pitcher Jon Lester, putting the Mets up 1-0. It was Murphs third straight post season game with a HR, his fourth overall. The Mets went on to a 4-2 win. Trivia: The so called curse of the Chicago Cubs stems back to 1908 involving a Billy Goat named Murphy! 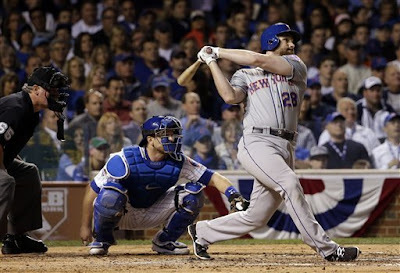 In Game #1 of the World Series Murph did not hit a HR the streak ended & even though he got two hits, it was a let down. 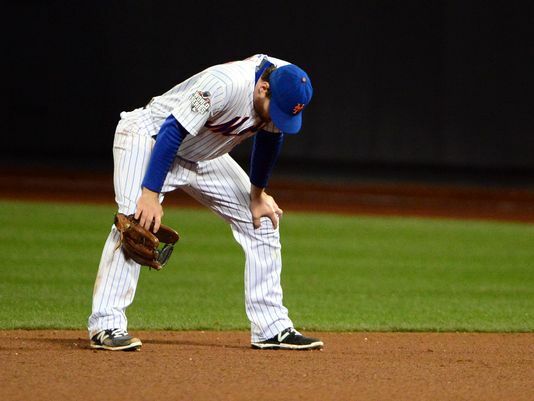 He got no HR, he had seven at bats & the Mets lost the game 5-4 in heart breaking extra innings. In Game #2 he drew a pair of walks in the Mets 7-1 loss at Kansas City. He would only cllect one more hit the rest of the way going an overall 3-20 in the World Series. 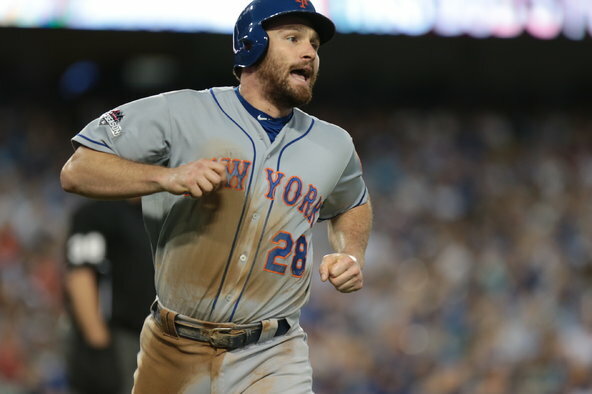 In Game #4, something the Mets had always disliked about Murph came through to haunt them, his defense. With the Mets clinging to a 3-2 lead, Tyler Clippard walked two batters and ended his fate as a Met. Murph was next as an Eric Hosmer little roller went thru him & into center field. That opened the flood gates at the Royals added a pair of hits to take the lead & go on to a 5-3 win. 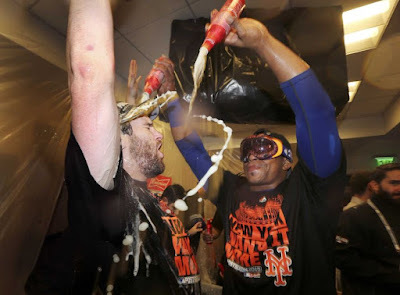 It was a sad ending to Murphs great post season & Mets career. In the off season he was let go as expected to free agency. 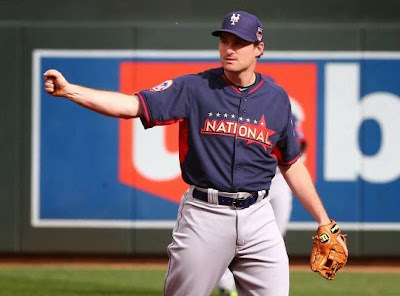 Murph signed on with the rival Washington Nats. This proved to be one of the worst moves the Mets made in that off season, as Murphy became a superstar & haunted the Mets for the next two seasons. 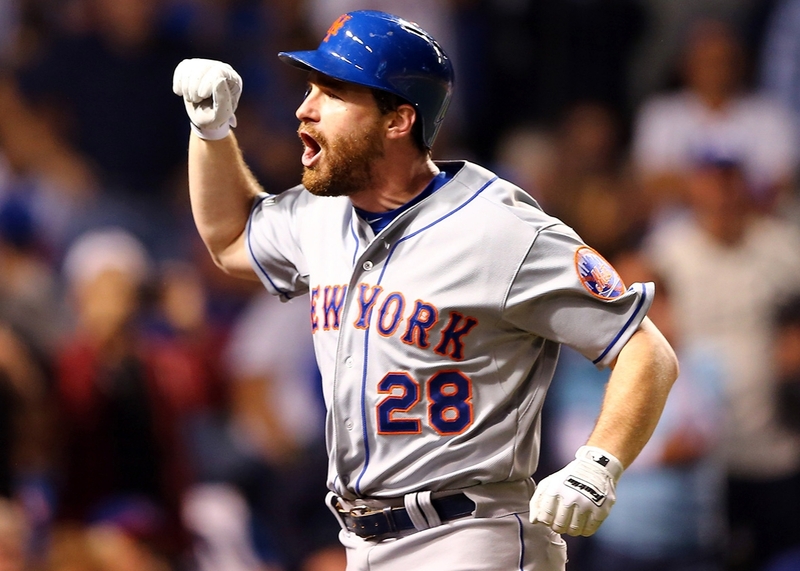 All Time Mets Leader Board: Murphy is third on the all time Mets list with 228 doubles. He is fifth on the All Time Mets second baseman games played list with 509. He is 12th with 402 RBIs & 967 hits. He is 13th with 422 runs scored. He is also 15th all time in games played with 903. In 2016 he hit .347 (2nd in the NL) with 184 hits 25 HRs a league leading, 47 doubles & .595 slugging %. He had 104 RBIs (4th in the NL) 8 sac flies (6th in the NL) & a .390 on base % (7th in the NL) playing in 142 games. Murph came in second place in the NL's MVP voting. Murphy continued to produce in 2017 for the NL Eastern Champion Nats, he was second in the league in hitting at .322. He collected 172 hits (8th in the NL) with 23 HRs a league leading 43 doubles 93 RBIs 94 runs scored & a .384 on base %, making his third All Star team. Post Season: In the NLDS loss to the Chicago Cubs, he hit just .211 but connected for a HR in the final Game #5 loss. 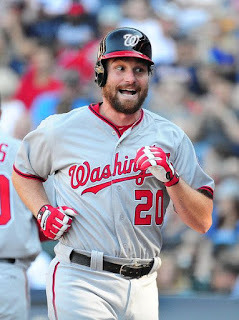 In 2018 he batted .300 before the Nationals who were clearly not making the post season, traded Murphy to the Chicago Cubs for a minor leaguer. 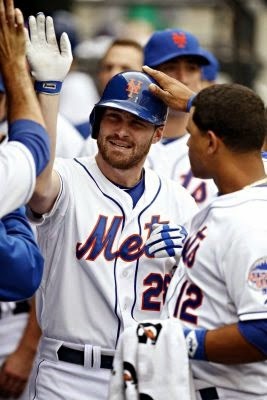 Murph hit .297 with 6 HRs & 13 RBIs in35 games. He made the post season once again & In the NL Wild Card game he went 0-4. 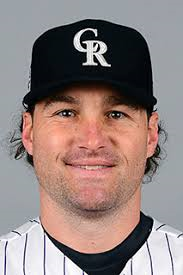 In the off season he signed on with the Colorado Rockies. 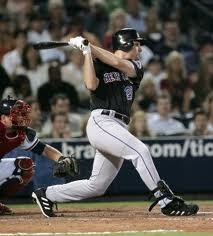 In his ten year career Murph has 1421 hits with 122 HRs 333 doubles 28 triples 641 RBIs 644 runs scored & a .344 on base %.